Joel Smedes, PE teacher at Vientiane International School in Vientiane, Laos shares his Human Frogger activity idea used for an Adventure Challenges unit. It’s a fun way to turn games into reality! This game is an original that I created. I simply got the inspiration from the popular Human Hungry Hippos activity. I brainstormed ways we could have students act as frogs to get across to the other side. After a bit of trial and error within our class, we came up with the following format, where one frog is protected by their team to help them cross the floor, avoiding the balls being rolled at them. Teams are divided into groups of 5-6 depending on your class size. The goal is to get into their base by leaping like a frog and avoiding the balls being rolled at them by the other teams on the sides behind the ropes. In the challenge, frogs must jump one at a time like in the computer game, but they can use team mates (who can walk/stand) as blockers to help them get across. If a frog or blocker is hit, they must return to the start (blockers race back to become a blocker again). The number of balls used to roll at the frog matches the number of frogs/blockers in the game. Ex. 1 frog and 4 blockers = 5 balls. Once a frog is in their home, they must stay there, meaning the number of blockers decreases as frogs make it home but the number of balls decreases also. The final frog will have to make it by her/himself, avoiding one ball but having no blockers. The teams must discuss their strategy before beginning. If time allows, teams continue until all frogs are home. If not, divide time equally and see how many frogs can make it home in the allocated time. 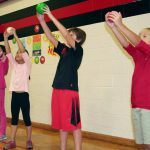 To set up, begin creating side lines with a rope or cones that the teams rolling the balls must stay behind, then create a target area for the teams to aim for, which is their home base. If your school has a pool, you can try this activity in the water. This is also a great activity for summer camp or recreational programs during the hot summer months. We had ordered and received large pool mats and I immediately thought of the computer game where the frog jumps from log to log. I thought, why not make the frog jump from mat to mat? 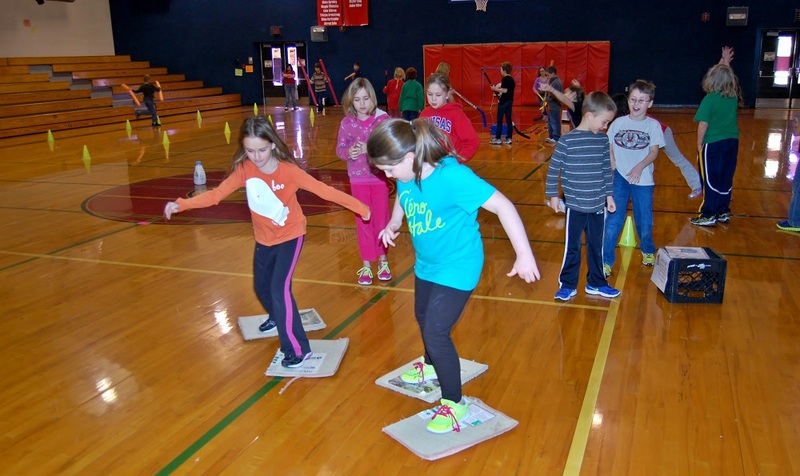 With a bit of trial and error again, our class devised the following way to make the mats move up and down the pool as if the students in the pool were acting as the game itself, moving platforms up and down evenly, a challenge within itself. The majority of students need to be in the water acting as the computer game to move the platforms that the frogs jump across. Have one student on either side of a floating mat to hold and secure the mat whilst walking up and down the pool. The remaining students will line up as frogs on the side of the pool to begin leaping across. The frogs need to line up on the side of the pool waiting for their turn and there can only be one frog on a platform at a time. Once that frog has made it across, they can then change with another student in the pool moving the platforms. The challenge actually ends up being to keep the game moving and keeping platforms straight and in line. Instructions were given to students to “Act like the computer game” meaning they couldn’t deliberately speed up or turn when a frog was about to jump to their platform, they simply had to move up and down like a mechanical platform in a game, which was a challenge. I am a PE teacher from Melbourne, Australia who really enjoys Primary PE & Swimming. I have also taught Secondary PE and spent 7 years in primary classrooms before returning to Primary PE. I currently live in Vientiane, Laos with my wife Mara and our three children: Benita, Zintis and Vilnis. Mara is also a teacher and we have taught in a number of International Schools overs the last 14 years in places such as China, Oman, Latvia, Angola and now Laos. 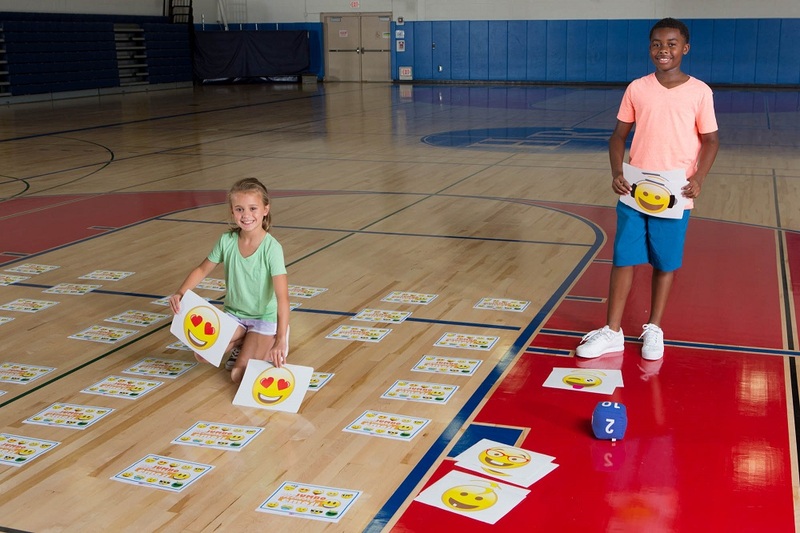 I strive to think of ways for students to absolutely love their PE sessions so that those positive experiences may lead to students adopting a healthy and active lifestyle in the future. I also enjoy coaching teams, leading after school activities and organizing events such as Sports Days & Swim Meets. 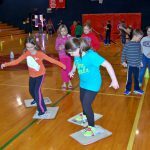 I also maintain a blog (www.peswimstuff.com) to share my work with other teachers because I believe in true and free collaboration and sharing of games, ideas and units. Feel free to try any activity you like. 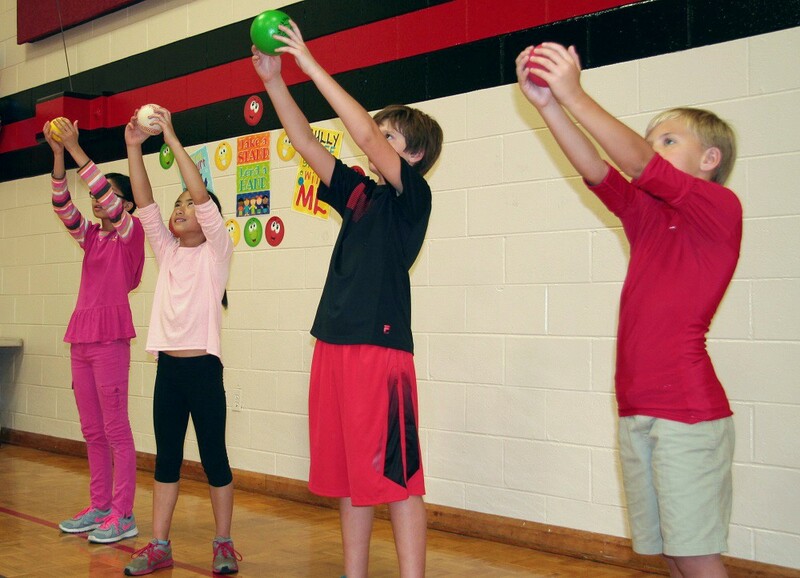 This entry was posted in PE Activities & Games, PE Central and tagged Education, elementary school, fitness, Frogger, Games, Human Frogger, Joel Smedes, PE, PE activities, PE activity, PE Central, PE games, pe teacher, PE Teachers, physed, Physical Education, teacher, Teachers by S&S Worldwide. Bookmark the permalink. Great games . I love them. Challenging games full of fun and creativity. The best part is everyone is involved.